Maserati unveils an all-new Quattroporte for 2014, as the Italian automaker attempts to rejuvenate itself and goose sales worldwide. Currently operating under FIAT's ownership, along with such exotic car brands as Ferrari and Alfa Romeo, Maserati has stumbled over the past few years, and sales have faltered. But over the next few years, the Trident-branded automaker will launch or relaunch a number of its iconic models, starting with the sixth-generation Quattroporte 4-door luxury sedan, which debuted at the 2013 North American International Auto Show in Detroit. If the initial worldwide reaction serves as any sort of indicator, Maserati has a big hit on its hands, since sales of the new Quattroporte have been surprisingly strong. And not without good reason. From its wide-mouthed black-slatted open grille and deeply curved hood to its side vents, quirky window line, rising rear haunches and stately stance, the Quattroporte certainly looks like a high-end luxury sedan with a sporty pedigree. What it doesn't necessarily look like is the world's fastest upscale sedan, but with a sub-5-second 0-60 time and a top speed of 191 mph, the Quattroporte blows away just about any competitor. That kind of power and good looks in one package, along with an iconic Italian automotive name on the back trunk lid just below the integrated spoiler, will surely turn the head of any car lover. To get that 191-mph top speed, you'll have to opt for the upper-level Quattroporte GTS trim, which comes equipped with a Maserati-designed, Ferrari-built 3.8-liter twin-turbocharged V8 engine. The relatively small V8, which replaces a larger 4.7-liter V8 powering the previous generation, produces an impressive 523 hp and 524 lb-ft of torque at 2,250 to 3,500 rpm. That's good enough to drive the Quattroporte from a standstill to 60 mph in just 4.6 seconds and on up to that landmark top speed of 191 mph. The EPA estimates fuel-economy numbers of 13 mpg city/22 highway for the V8, which aren't totally abysmal for a car of this caliber. The direct-injection engine links to a new ZF 8-speed automatic transmission with a manual-shift mode and brushed aluminum paddle shifters. The transmission does a good job of handling all that power and delivers smooth acceleration, according to reviewers. The engine itself offers Normal, Sport and ICE (Increased Control Efficiency, for icy road conditions) driving modes. Owners can also opt for a 3.0-liter twin-turbocharged V6 engine, which powers the entry-level Quattroporte S Q4 trim. The V6 generates a still-respectable 404 hp and 406 lb-ft of torque over a broader range of 1,750 to 5,000 rpm. 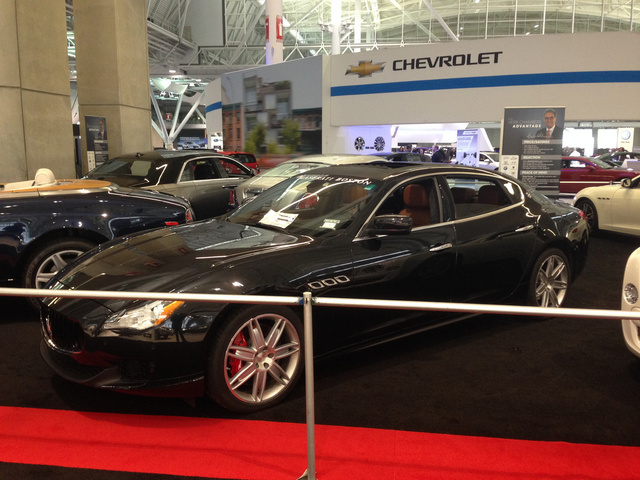 The V6 pushes the Quattroporte to 60 mph in 4.8 seconds and posts a top speed of 176 mph. It mates to the same 8-speed transmission, with fuel economy numbers checking in at 15/24. Both engines require premium fuel. Although it's not as quick or flashy as its V8-equipped big brother, the S offers a more reasonable price tag, although both feature stickers on the north side of six figures. Despite its eye-catching performance numbers, the Quattroporte remains a luxury sedan and not necessarily a performance vehicle. That's evident from the sedan's 4 doors, as well as the S Q4's standard 4-wheel drive (4WD), which some say mars its performance credentials. However, those 4 doors also make the Quattroporte a practical racer and one the whole family can enjoy. The Italian-designed 5-passenger cabin provides plenty of legroom and headroom in both the front and back, thanks to a lengthened 124.8-inch wheelbase, compared to the previous generation's 120.6-inch wheelbase. The long wheelbase also allows for an expansive 18.7 cubic feet of cargo space in the trunk. Wraparound heated 8-way power-adjustable front seats with 4-way lumbar and memory for the driver are comfortable and supportive, while the rear seat includes a foldable center armrest with two cupholders and a USB port. The GTS upgrades to heated rear seats. Owners can also opt for 2 individual heated, ventilated and power-adjustable rear seats with a center console. Poltrona Frau leather upholstery comes standard on both trims. The S features Radica wood trim, while the GTS gets Erable wood trim. Maserati offers a variety of leather and wood trim upgrades, including Tanganika and Ebano wood trim. Up front, the 3-level dash features hand-stitched leather and wood trim, with a wide center console between the seats and a centrally located 8.4-inch Maserati Touch Control touchscreen, which drivers can use to manage the car’s entertainment and information systems. The 3-spoke steering wheel, equipped with brushed aluminum paddle shifters on the GTS trim, also comes wrapped in leather. The S trim features a second 6-inch display on the dash, which provides details about the front-to-rear torque split of the 4WD system, while on the GTS the display shows mechanical and vehicle information. Both trims include navigation, Bluetooth, a rear-view camera and a 10-speaker 600-watt audio system, all accessible through the 8.4-inch touchscreen. Ambient lighting, dual-zone climate control, keyless entry, push-button start and a power tilt/telescopic steering column are among the other standard features. Owners can upgrade to a 15-speaker 1,280-watt Bowers & Wilkins audio system, as well as ventilated front seats, a heated steering wheel and a rear entertainment system, among other optional features. Outside, the Quattroporte comes equipped with a number of upscale exterior features, including HID automatic headlights, daytime running lights and an Adaptive Front Lighting System, which swivels the headlights to help drivers get a better view around corners at night. A headlight washing system and LED taillights are among the other standard exterior features. Most testers agree the Quattroporte rides and handles well, thanks to its long wheelbase and good overall balance, as well as its relatively light weight. The new Quattroporte tips the scales at 4,610 pounds, or about 200 pounds less than its predecessor. Maserati completely redesigned the frame and chassis, which are made primarily from aluminum. The suspension features Skyhook electronics with continuously damping shock absorbers, as well as a double wishbone front suspension and a 5-arm multilink configuration in the rear. The Skyhook system offers driver-selectable settings for both comfort as well as dynamic handling with stiffened shock absorbers. Brembo brakes come standard, along with speed-sensitive electrohydraulic steering. The S trim gets 19-inch alloy wheels, while the GTS rides on 20-inch alloy wheels. Standard safety features for the Quattroporte include the Maserati Stability Program, which incorporates electronic stability control and traction control, as well as antilock brakes with electronic brakeforce distribution. In addition, a Brake Apply Sensor automatically recognizes emergency stops and increases brake pressure to aid the driver in stopping the vehicle. Front and rear parking sensors also come standard, along with Active Cruise Control and a Hill Holder system. The Quattroporte has not been safety-rated by the IIHS and the NHTSA. 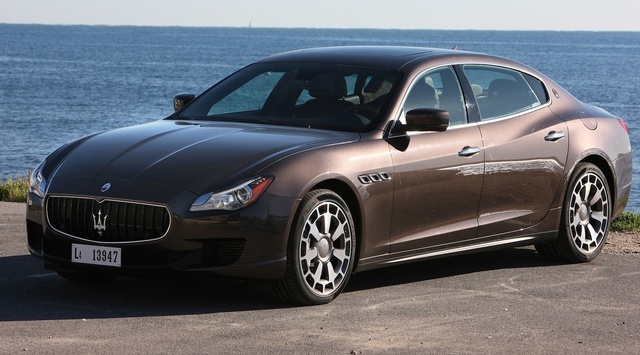 What's your take on the 2014 Maserati Quattroporte? Users ranked 2014 Maserati Quattroporte against other cars which they drove/owned. Each ranking was based on 9 categories. Here is the summary of top rankings. Have you driven a 2014 Maserati Quattroporte?